One of the most colorful floribunda roses we've found! 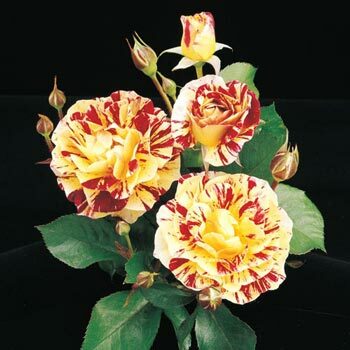 George Burns Floribunda Rose's bright cheery, ever-changing yellow, deep red, rose pink and creamy white flowers open against deep green, glossy foliage. Cooler temperatures really bring out the yellow hues. The 4" ruffled flowers have a mildly fruity fragrance and look stunning in the garden and cut floral arrangements. 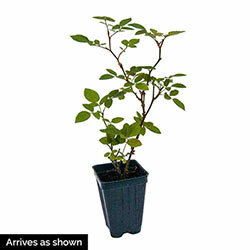 This compact floribunda rose has a rounded, upright habit and good disease resistance. 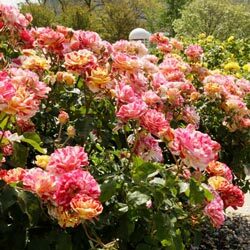 Floribunda roses combine elegant hybrid tea form with the cluster-forming habit. Soil Requirements: Well drained soil, humus rich soil.